You can learn more about events planned for this year on our new website! Connect Your Class with Author Kate Messner! -- To celebrate the National Day on writing, We Are Teachers is offering a unique opportunity for you to connect your classes with an award-winning author! On October 20th, connect your classroom with author, Kate Messner through Google Hangouts. Read also this blog from NCTE member Nicholas Provenzanorom (@TheNerdyTeacher) about Kate's appearance. NCTE: "Why Should Celebrate the National Day on Writing?" with NCTE member Stephen J. Parks, associate professor of writing and rhetoric, Syracuse University, and incoming editor of the CCCC Studies in Writing and Rhetoric book series, discussing the teaching of writing and the National Day on Writing. National Writing Project: On this National Day on Writing we will focus on the what, how, and why of writing and we are asking people in our community to share their writing life by posting on social media with the hashtag #whyiwrite. To get the conversation started, members of NWP's Writers Council—all authors of YA novels—will join us on the program. "People in every walk of life, in every kind of work, and at every age write more than ever before for personal, professional, and civic purposes," writes Lisa Fink in this Literacy & NCTE Blog. "#Twitter in October," writes Lu Ann McNabb: October, which is Connected Educator Month, is a wonderful time for NCTE members to advocate through Twitter using two hashtags: #WhatWeHonor and #WhyIWrite. You can advocate generally by just posting on your own page, or you can tweet directly to your elected representatives using the Twitter handles outlined in Twitter as an Advocacy Tool and Governors Play a Key Role in Education. Celebrate the National Day on Writing: Encourage your students to uncover all of the different kinds of writing they do on a daily basis by asking them to keep a list of everything they write, from text messages to school assignments, e-mails to diary entries, in a single day. "In a time when we write more — not less — than we ever have, it’s vital for us to champion the unique value of writing," writes NCTE member Sean McComb in this Teaching Channel blog. Why do you write? Every year on Oct. 20, we band together with partners like NCTE, the National Writing Project, and the Teaching Channel to encourage teachers, students and the world at large to celebrate the National Day on Writing by sharing their thoughts on Twitter. Why I Write: 2015 National Day on Writing. What, how, and why do you write? This year we are asking people in our community to share their writing life with us. Post your writing during the National Day on Writing Tweet-Up on October 20 with the hashtag #whyiwrite. The Best Resources for the National Day of Writing. "It’s important for everyone to share their knowledge about writing, organize participating groups in our schools and/or communities, and transform the public’s understanding of writing and the role it plays in society today." Writers Share #WhyIWrite on Twitter for National Day on Writing. "Using the hashtag #WhyIWrite, writers around the world are taking to Twitter to tell their followers what compels them to put words on a page. Even some people who are famous for things other than writing, including Steelers linebacker Vince Williams, among others, have been using the hashtag." National Day on Writing: Writers Expressed Their Love For Writing Via Twitter. National Day on Writing has been the new Valentine's Day for writers around the world. As established by the National Council of Teachers, National Day on Writing has been celebrated by writers from all walks of life on October 20. It's a day to celebrate writing and its significance in our national life. Toolwire Celebrates National Day on Writing through Game-Based Learning. As educators nationwide celebrate the National Day on Writing, community colleges are leading the way in the use of a new instructional tool for developing foundational writing skills: digital game-based learning. This fall, more than 20 institutions are piloting a series of 17 writing games launched earlier this year by Toolwire, a leading educational game provider that will deliver game-based learning to over 250,000 students in 2015. Today, thousands of people are telling the world why they write. What's your reason? Today, Oct. 20, is the National Day on Writing. Never heard of it? I hadn't either. But now that I know, I'm really, really into it. The University of Alabama in Huntsville will be celebrating NDoW for the first time this year! We will host about a dozen reading, writing, and literacy organizations for our campus and the Huntsville area on our central greenway. Each group will provide a writing-related activity to engage students and other passers-by, as well as promoting their organization. The event will be from 12-2 pm at UAH Greenway near Charger Union. It is free and open to the public. Bestselling author Nathan McCall will serve as the guest speaker during Fall Convocation at the University of Arkansas at Pine Bluff that will also commemorate the National Day on Writing. The free, public event will be held Tuesday, October 20, at 11:00 a.m. in the Kenneth L. Johnson, Sr. HPER Complex. Writers' Workshop Celebrates National Day on Writing: Celebrate the National Day on Writing at the University of Illinois at Urbana-Champaign with the Writers' Workshop on Oct. 20: Tweet the Workshop why you write @WorkshopUIUC #WhyIWrite; look for our video "Why I Write" on screens around campus; come by our open mic from 4-6 p.m. in the EB Atrium to read your own work or an excerpt of something you love; visit us at 251 UGL to win door prizes and learn about our services. Iowa City Public Library: Celebrate the National Day on Writing with the Iowa Youth Writing Project from 3 to 6 p.m. Oct. 20 in the Storytime Room at Iowa City Public Library. The Springfield College Humanities Department will celebrate the National Council of Teachers of English’s seventh annual National Day on Writing on Tuesday, Oct. 20 from 10 a.m. to 2 p.m. This event recognizes the importance of writing nationwide and its impact on our communities. As part of the celebration, children at the Springfield College Child Development Center will be drawing on the backs of postcards that will be mailed to the homes of the children participating. The Humanities Department will also be hosting a postcard table on campus encouraging students to write letters to their families back home. The Springfield College Babson Library also will be hosting an event during the day that will encourage students to write on paper hung on the walls of the collaborative learning area in response to the NCTE's theme of #WhyIWrite. Thanks to the support of the Writing Across the Curriculum Committee, similar versions of this activity will be hosted by the Departments of Psychology, Education, and Occupational Therapy, as well as by the School of Continuing and Professional Studies. In addition, the Springfield College Career Center will host a table in the Flynn Campus Union during the celebration encouraging students to write about what they plan on doing following their time at Springfield College. Find Your Writing Center: Join us in the University of Nebraska at Omaha Writing Center on Wednesday, October 21, 11 a.m. to 1 p.m., for food and activities. See how the Writing Center can relieve stress and help you find your center during the school year. There will be origami, haiku writing, yoga, and snacks. We hope to see you there! On Tuesday, October 20, 2015, North Dakota State University (NDSU) will participate in the National Day on Writing, an annual event organized by the National Council of Teachers of English (NCTE) to “draw attention to the remarkable variety of writing we engage in” http://www.ncte.org/dayonwriting. This year, the Jones White Writing Center and the IUP Writing Across the Curriculum Program are celebrating the National Day on Writing through Instagram! All members of the Indiana University of Pennsylvania community are invited to Instagram writing selfies (a picture of yourself writing) in your favorite space, with your favorite tools, or with your favorite company; add a caption describing what writing means to you, and include both hashtags #WhyIWrite and #IUPWrites. On October 20th, prizes will be awarded to random Instagramers in honor of the National Day on Writing. Students at Claude O. Markoe Elementary School in St. Croix will hear from poets, journalists, authors, and other literary persons during the National Day on Writing observance scheduled for Tuesday, Oct. 20. The Wyoming Writing Project will host a Writing Marathon on the University of Wyoming campus starting at 9:00am in the Literacy Research Center and Clinic. The marathon will last an hour with optional open mic at 10:00am. Follow us on Twitter @wyowriting and #wyowriting #WhyIWrite. National Writing Project: "Write My Community: The 2014 National Day on Writing"
The New York Times Learning Network Blog: "10 Ways to Explore and Express What Makes Your Community Unique"
A Writer's Vanity: "National Day on Writing"
Connected Educators: "Celebrate NCTE’s Sixth Annual National Day on Writing — Monday, October 20, 2014"
Anne Frank Center USA "Conversations with Anne": The center in New York City, a partner to the Anne Frank House in Amsterdam, created “Conversations With Anne” in 2012 for its new space in Lower Manhattan. Drawing on the unexpurgated journal — “The Diary of a Young Girl: The Definitive Edition” — the organization developed several scripts to use during the program. “Growing Up in Hiding,” the one to be performed on Saturday, October 18, includes entries about Anne’s tentative romance with Peter van Pels and her frustrations with the adults around her. “They still see her as a child, when she really doesn’t feel that way,” said Ms. Vaughn, who compiled the script. Ultimately, “it also touches on her hopes and dreams.” Intended to celebrate the National Day on Writing (Monday), the program incorporates a tour of the center’s gallery and a writing exercise: Children will choose one of a series of quotations from the diary and connect it to their lives. Margaret Simon: "My students decided to Tweet a choka challenge, a form of haiku with a 5,7,5,5,7,5 syllable pattern. We are also visiting other blogs and leaving comments. We call this a Comment Invasion. Happy National Day of Writing!" See also "A Jackpudding of Unjustly Forgotten Words for This National Day on Writing." Kerri K. Morris: "National Day on Writing: Writing is power, words matter"
Michael Rifenburg: "#WriteMyCommunity and Running"
Coinciding with the National Day On Writing (2014), Athens State University will host a one-day writing conference on "Building Success through Writing Faculty" and students from a wide variety of backgrounds are invited to attend and participate. This conference will focus on how the qualities of successful writing help people make lasting connections in their lives and careers. We invite faculty and students from various backgrounds and disciplines to attend the conference and participate in sessions that take a deeper look at the role of writing--as a measure of success, as a practice, or as learning tool--in K-12 and higher education. In this video, Director of UA's Creative Writing Program, Chris Cokinos, talks about the most difficult thing he's ever written. "Family Weekend: Colleges Open Doors to Families for Weekend": The University of Arizona will sponsor a National Day on Writing event during Family Weekend. The Center for Writing and Communication at the University of Arkansas at Monticello will observe the National Day on Writing with a day of games, exercises, crafts and performances on October 20 from 8 a.m. to 2 p.m.
California State University Fullerton invites students and staff to (1) Stop by the Writing Center (Pollak Library North, first floor) on October 20 anytime between 12 and 6pm to share your voice on a poster and sticky note campaign about writing on our campus. and (2) Celebrate this "unevent" from social media by posting about the writing that matters to you using the hashtags #WriteCSUF and #WriteMyCommunity over the day! For more information - including signing up for a short shift to encourage others to write for this "unevent" - please contact Martha Webber, the Teaching Writing Club, or the Creative Writing Club. POLYTECH Adult Education students are writing their own personal essays about how they have overcome barriers and obstacles to learn and achieve success in their lives. Their stories describe their individual journeys and highlight how the educational community, other support agencies, and their families all contribute toward helping them reach their career goals. The writing will be on display the day of the event for a "POLYTECH Wall of Writing." See a video and pictures from the POLYTECH event. In celebration of the National Day on Writing, the Emory University (Atlanta) Writing Center will be festively decorated and offering refreshments to visitors on Monday, October 20, 2014. Georgia State University will be celebrating the National Day on Writing by gathering 11 different literacy organizations on campus in the campus Courtyard. Among these organizations are GSU's literacy journals, Writing Studio, Library, ESL tutoring services, Graduate English Association, the school newspaper, and the Digital Literacy Archive. All organizations are tasked with promoting their work and engaging students with a literacy related activity. In honor of National Writing Day, Cary District 26 will have its traditional writing exercises. But this year, they will do so in honor of Patricia Sylvester, who died in the spring after a battle with skin cancer. Sylvester, an NCTE member who was a teacher in the district for more than 30 years, taught fifth, sixth and eighth grade. She taught English at the junior high and worked as the gifted program coordinator. She also taught at the now closed Oak Knoll and Prairie Hill schools. “Pat was instrumental in getting all the schools to participate in National Writing Day,” Cary Junior High eighth-grade teacher Kathy Englund said. See also "National Day on Writing Has Special Meaning This Year." The Morehead Writing Project will partner with Morehead State University campus partners: Camden-Carroll Library, Epsilon Mu, and Tutoring and Learning Center as well as community partners: CoffeeTree Books and Gateway Center for the Arts for Celebrating Writing Eastern Kentucky in conjunction with the sixth annual National Day on Writing (Monday, Oct. 20) sponsored by NCTE and NWP. Celebrating Writing Eastern Kentucky will begin with the Fall 2014 Teen Writers Day Out on Thursday, Oct. 16, and wrap up at the 2014 Writing Eastern Kentucky Conference on Saturday, Nov. 8. "We are pretty excited. We did this for five days last year and had so much fun we decided to expand," says NCTE member Deanna Mascle, a coordinator of the event. The University of Southern Mississippi Gulf Coast is hosting The Gulf Coast Compose: A Celebration of the National Day on Writing on Monday, October 20. The Live Oak Writing Project will host write-ins on the Southern Miss Gulf Park campus and support writing activities in public classrooms from Pascagoula to Bay St. Louis. "At Stella and Charles Guttman Community College at the City University of New York, every class will start the day with a short writing determined by the professor to encourage writing across the curriculum. Additionally, we will have a live Tweet Station in our Information Commons where students can sit and tweet ideas related to #writemycommunity. After tweeting, they will receive our third annual National Writing Day bracelet which reads, 'I’ll Show You Mine If You Show Me Yours NWD 2014' which we are sure the students will love," NCTE member Lori Ungemah says. Excelsior College will celebrate 'National Day on Writing' (October 20) with a webinar featuring renowned writer, NCTE member Doug Downs from Montana State University. His presentation, entitled “What We Tell Ourselves about Writing: Cultural Stories of Writing and Their Effects," will focus on the stories we tell about writing and the lessons we can learn from them. In addition to the webinar, Excelsior College will celebrate the day with an essay contest for Excelsior College students and alumni. Visit the OWL for complete contest rules and more information about the prize! 9:00am-5:00pm, “Found Poetry,” NDSU Department of English Facebook Page: The NDSU Department of English will feature found poetry by students and faculty on its Facebook page. In found poetry, writers take "found" text from any source, like books, newspapers, and advertising, and remix it into a poem or image using erasure, centos, nets, and other techniques and forms. "Like" the department's Facebook page to receive the poems in your news feed throughout the day. 10:00am-1:00pm, “Resources for Writers,” Lobby, Memorial Union: The Undergraduate Center for Writers will staff a table in the lobby of the Memorial Union. The campus community will be able to learn about the services offered by the Center and to have fun with word games and writing activities. 10:00am-4:00pm, “EndNote Online/Cite While You Write Help Station,” First Floor, Main Library: The NDSU Libraries will provide walk-up help for EndNote Online and Cite While You Write. You can use EndNote Online to organize your references and create lists. Cite While You Write is a plug-in for Microsoft Word that allows you to build your reference list as you write your paper. 3:00pm-4:00pm, “The Walk Across North Dakota and the Journey of Writing,” Mandan Room, Memorial Union: The Undergraduate Center for Writers will host Gwen Hoberg, co-author of the travel memoir The Walk Across North Dakota, as she discusses hiking across North Dakota, the types of writing completed during the hikes, and the process involved in both self-publishing and traditional publishing. She will also read selections from her book. Space is limited and reservations are required. Writing Center Seeks Student Essays for "Berks B Believes" anthology: In honor of the National Day on Writing, the Penn State Berks Writing Center, in collaboration with First-Year Seminar and the Learning Center, is soliciting student submissions for an in-house publication of "Berks Believes," an anthology of student-written essays that follow in the tradition of the "This I Believe" essay made famous by the 1950s radio show by the same name. In celebration of the National Day on Writing, Monday, October 20, the Writing Center and the Writing Across the Curriculum program at Indiana University of Pennsylvania will hand-write a note of appreciation on a card and deliver it for free on your behalf! 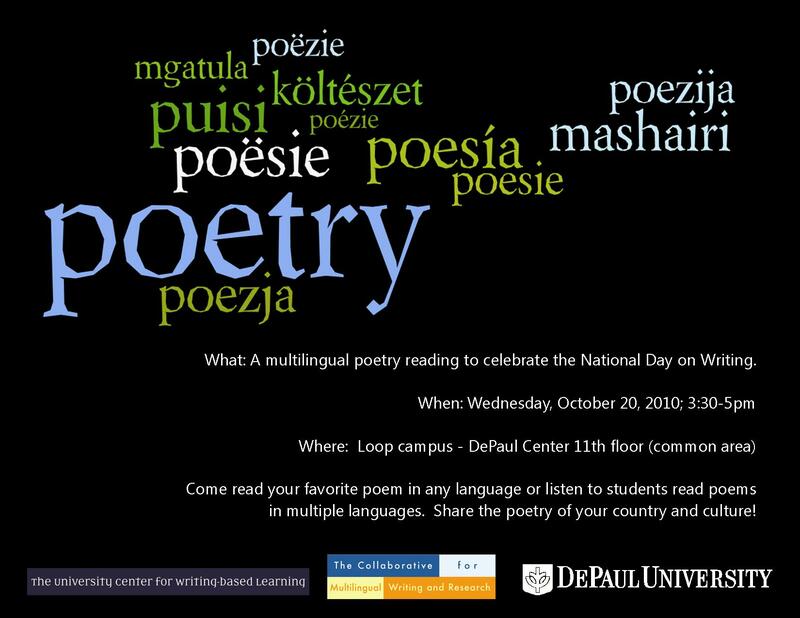 York College students will celebrate the National Day on Writing on Oct. 20 at the YCP Write Out. The College’s Writing Center is sponsoring a series of events in Spart’s Den (lower level of Iosue Student Union) from noon – 4 p.m. Noon -1 p.m. Writing on Campus: Students will meet representatives from the Writing Center, Professional Writing Major and Minor, Creative Writing Minor, The York Review (YCP literary publication), Story (YCP magazine), the Bob Hoffman Writing Contest, and The Spartan (school paper). They are invited to join a magnet poetry competition, play literary telephone, and create blackout poetry. 2 -3 p.m. Peer Review for The York Review and the Bob Hoffman Writing Contest: Students will bring work they are interested in submitting to the literary publication The York Review or the Bob Hoffman Writing Contest. For more information: Megan Schoettler, York College Writing Center Assistant, mschoett@ycp.edu. In honor of the National Day on Writing, the Department of English, Speech, and Foreign Languages at Texas Woman's University will host a letter writing and mail art station in our Student Union from 11-1 on Monday, 10/20. Visitors will be provided with materials to write and mail members of their community, and have the chance to explore a digital installation of resources and videos exploring the intersections of literature, history, and letter writing. The University of Texas Dallas Writing Center Facebook page include pictures of its National Day on Writing activities. Read about the online and other events that took place to celebrate the 2013 National Day on Writing! eSchool News: "National Writing Event Trending on Twitter: Educators Celebrate National Writing Day Online and with Social Media"
Susan Naomi Bernstein: "Every Day a Writing Day"
Britton Gildersleeve: "waiting (impatiently!) for the National Day on Writing" and "Nimrod Saturday!" Judy Kozak: "Celebrating National Day on Writing with Students"
Katherine Sokolowski: "Celebrating the National Day on Writing," "National Day on Writing -- Write to Connect," and "Celebrating Writing -- Slice of Life"
National Writing Project: "Write to Connect: 2013 National Day on Writing" The National Writing Project and its Educator Innovator Network — along with the National Council of Teachers of English, the New York Times Learning Network, and a host of other collaborators — are encouraging us to take to Twitter to speak out about how writing helps us connect. Herndon High School, Herndon, VA: "Write Here, Write Now"
Colorado: Twin Peaks Charter Academy (TPCA), Longmont (just to the north of Denver), will be holding our first ever community writing night in accordance with the National Day on Writing on Thursday, October 17th, from 6 to 8 PM. We are in the early planning stages of this event, but teachers are on board, the PTO is on board, now it's time to get the community on board. Illinois: NCTE member Amy Orvis's 7/8 grade humanities classes will spend the entire morning having writing circles, writing workshop, implementing writing activities from Kelly Gallagher and Ralph Fletcher, and celebrating and enjoying writing! Maryland: In Howard County, Maryland, The Little Patuxent Review through a partnership with the Howard County Public School System Gifted and Talented Education Program will be holding our first Middle School Writers Festival. Through a grant from the Maryland Humanities Council, professional writers will be leading workshops with middle school writers on interest-based topics and will be facilliating school-based groups as they work together as a writers' community learning strategies for revision. The day will culminate in a reading and Open Mic session. Maryland: Montgomery College, a community college in Maryland, is hosting several events at the Germantown Writing Center to celebrate the occasion. First, poetry and “status story” contests will be held on our Facebook page. These contests are open to all students and will be judged by members of our faculty. Second, I have gathered some books and artifacts for a small exhibit on the history of writing instruments. Some additional resources I have gathered are available on our blog. Last, and perhaps most exciting, a Korean calligrapher, Myoung Won Kwon, demonstrated his talents on Monday, October 21 at 2 PM. WID is also hosting several events across all three campuses where students will be responding extemporaneously to writing prompts. Desserts will be served! New York: Literacy Matters (Hartford) Students will have a display at a local community center; see "Class Is for Students Who Like Putting Thoughts on Paper"; a video of Lucia Davis, 13, of Rome, reading why she loves writing; and a video of Christina Moretz, 15, of New Hartford, telling why she writes. This years' theme for the National Day of Writing activities is “Write to Connect.” The official date of National Writing Day is Sunday, October 20. On Monday, October 21, we will make stickers available to you that you may hand out in your classes. Please spend a few minutes on Friday, Saturday (for Saturday classes), or Monday in both your second year and first year courses talking about the ways writing helps us to connect/communicate. Feel free to write your own prompt. Our goal is to show students that we are a community of writers! Paul Naish has written the following prompts for this year's celebration. The activity is a five minute writing activity with an additional five minutes for students to text the message, email or snail mail! Prompt: In honor of National Writing Day, take five minutes to write a message to someone you know—or someone you don’t know. Write to a family member you take for granted and express how much that person helps you. Write to a relative or friend who doesn’t live in New York and tell that person you miss him or her. Write to someone who encouraged or inspired you and say thank you. Write to a public official with a suggestion or a concern. Take five more minutes and send the message by text, email, or snail mail. Thanks for helping us to make National Writing Day a tradition at Guttman!! North Dakota: The North Dakota State University Center for Writers has a full day of events planned, including a Workplace Writing workshop. Pennsylvania: The Indiana University of Pennsylvania WAC program and Writing Center are hosting a live streaming of the tweets 12-2 pm on October 21 in the library (@IUP_WAC). Update: "We had more than 50 responses during our live tweet-a-thon on #dayonwriting and gave out 4 awesome prizes!" Pennsylvania: On Monday, Oct. 21, the Penn State Brandywine Writing Studio, in coordination with the English Department and student literary magazine, Penn In Hand, will host activities about writing in the Main Building and Vairo Library. Texas: At Lee College in Baytown, in observation of the National Day on Writing we are asking students and faculties to write thank you notes to accompany care packages being sent to soldiers overseas. This will let the soldiers know that we appreciate their services and sacrifices to our country. The faculties will pass out the thank you cards to students during class time. We are hoping to have the packages arrive on Veterans Day. This is our way of thanking our troops for their service. The New York Times: The Learning Network blog post "Encourage Authentic Writing with #WhatIWrite and #NaNoWriMo" (October 4, 2012) introduces the October 19-20 Tweet-out #WhatIWrite and encourages participation in this year's National Day on Writing. National Writing Project "Why I Write": The NWP has joined NCTE, The New York Times Learning Network, and others to collect the thoughts of people from all walks of life—scientists, reporters, poets, teachers, and students—to discover what they write. School Library Journal: Tweet What You Write! Education Week: "Celebrating Writing, Digital and Otherwise" and "Writing: Practice What You Teach"
Americans Are Writing Like Never Before: Celebrate! This document was printed from http://www.ncte.org/dayonwriting/celebrations/past.